Mini-hotel on your street? STVR next door? Different neighbors every week? Here’s everything you need to know about the Mayor’s proposed Short Term Vacation Rental (STVR) regulations but are afraid to ask. The City Council hearing and potential vote is scheduled for Monday, July 16, at 12 noon. Cities in tourist destinations like San Diego are facing a rapid growth in demand for cheaper short term stay accommodations. Many neighborhoods with homes and apartments in areas not planned for commercial use have been invaded in order to satisfy the demand. Cities such as Los Angeles, San Francisco, Santa Monica and Boston have enacted regulations to address the demand while taking into account the interests of all communities in their cities. Is regulation of short term rentals needed? Yes. Is the Mayor’s proposal fair and reasonable for residential areas and neighborhoods? No. Have you seen the Mayor’s proposals? Have you had a chance to read them? Has the Union Tribune published them? Has KBPS covered them? Have the media in general covered them? I doubt it because no one seems to be talking or writing about the Mayor’s proposal. The mega companies that benefit from the new industry surely must have seen the proposal and support it; they’ve spent millions lobbying for this proposal and all know the way to the Mayor’s and Councilmember’s doors. Our City Councilmembers may vote on the Mayor’s proposal as soon as July 16, 2018. 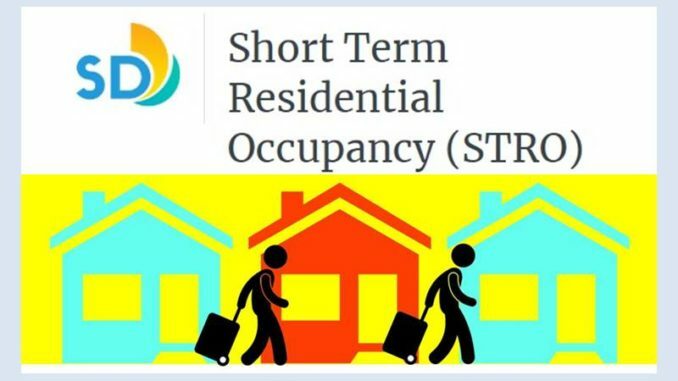 The San Diego Community Short Term Vacation Rental STVR Working Group feels that the Mayor’s proposal needs significant amendments; amendments that are unlikely to be thoughtfully worked out in time for a vote on July 16th. Local schools will continue to lose state funding because of the reduction in students caused by removal of whole homes for families in many neighborhoods. Some schools have closed in beach areas. Large and small employers will find it harder and harder to attract and keep staff because of the scarcity of homes for families that are affordable by the average employee. The housing crisis worsens, affecting families and the very low income residents. How should Mayor Faulconer respond to this challenge? The STVR Working Group wants the Mayor to remember that commercial areas and residential zones were established for good reasons. We don’t want industrial air and noise pollution invading our homes, parks and schools more than necessary – similarly we do not want commercial tourism with its attendant burden of trash, noise and increased traffic volume to invade those same areas. He should maintain the separation between commercial areas and residential zones. He should encourage more development of reasonably priced hotel spaces in commercial areas and not in residential zones. He should remove the “one residence + one” element from his proposal. Email the mayor and your Councilmember to demand regulations that are fair and reasonable to neighborhoods, not what Mayor Faulconer has quietly proposed; email contacts listed below. Attend UCCA’s monthly meeting on Wednesday, July 11, 6 PM, at the Community Library at 4155 Governor Drive, at which Mack Langston will provide and update on the efforts of the STVR Working Group. Ask local Realtors to help preserve the neighborhoods by stepping up and speaking out. Share this information with your employer and encourage friends to do the same. Reach out to anyone who cares about our housing crisis. Stay abreast of the situation by getting alerts from www.universitycitynews.org. Contact UCCA rep, Mack Langston 619-818-4205; langstonmack@gmail.com, for more information or for a speaker for your group. Attend public forum sponsored by the STVR Working Group on July 12, 5:30 PM at La Jolla Recreation Center, 615 Prospect St. in La Jolla to learn more about the Mayor’s proposal. Attend the City Council public hearing and potential vote on the Mayor’s STRO proposal at a hearing scheduled on Monday, July 16, at noon. Information courtesy of Mack Langston, University City Community Association’s representative to the San Diego Community STVR (Short Term Vacation Rental) Working Group which has reviewed the Mayor’s proposed STVR regulations. For more information about the San Diego Community STVR (Short Term Vacation Rental) Working Group, visit www.lajollatowncouncil.org.